The opening day of trout season is finally upon us, which signals for many anglers that it’s time to dust off the gear and get ready for spring fishing! For those who aren’t interested in trout; the holdover striped bass bite is really heating up and flounder reports are starting to pop up as well. Andrew, at Fishin Factory 3 in Middletown, told me that besides getting everyone geared up for opening day, he has also been selling more and more sand worms. The water temp has jumped a few degrees and anglers are starting to find some schoolies here and there. The herring runs aren’t too busy just yet in the big river, but we shouldn’t be too far away. Pike action has dropped a bit, but they can still be caught with pretty good consistency. The river is high and dirty, so look for backwaters and bright-colored plugs. Carp action is starting to go strong in the coves and Andrew just re-stocked all the carp gear you will need to find a giant. With opening day on tap for this Saturday, Andrew will be staying open until 10 p.m. on Friday and will reopen at 4 a.m. Saturday morning. As always, Cyr BBQ will be on site Saturday making breakfast sandwiches in the morning and pulled pork in the afternoon! Joe, at Rivers End in Old Saybrook, reports that the calico and yellow perch action remains consistent in the coves up and down the river, while the white perch bit in Hamburg Cove seems to be heating up. Blackfish and winter flounder have opened, and while it’s still a bit cold for blackfish, there have been some rumors of flounder out west. Anglers dunking sandworms are starting to find some schoolies around the river mouth; while the better striper action is still coming from the Housatonic. The herring are starting to fill in out there and it’s resulting in some bigger holdover moving up the river. The shop is fully stocked for opening day with all your trout needs! Chris, at Black Hall Outfitters told me that trout anglers are taking advantage of the recent stockings in the TMA’s before all the opening day craziness. The Hammonasset River was stocked yesterday and gave up good numbers of quality fish this morning. Tsunami Cocktail Spinners are producing well for the trout anglers and will be on sale all weekend at the shop. 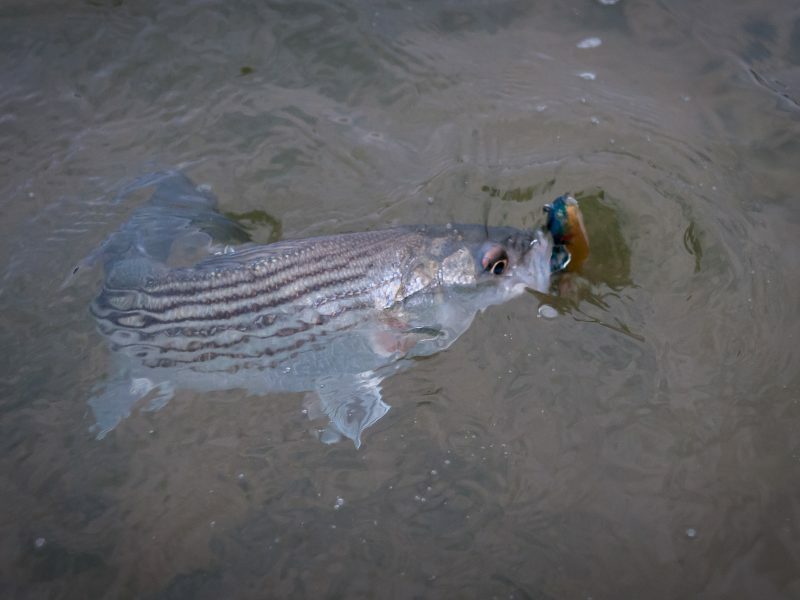 Flounder and blackfish reports are quiet in the salt, but the holdover striped bass bite continues to improve in all the tidal rivers. Mike Roy, of Reel Cast Charters in Old Saybrook, told me that they officially started their season last week, and are fishing light tackle/fly for holdover striped bass. One of his recent trips saw more fish come on the fly than on spinning gear, which is always a good time regardless of size. Some keeper fish are starting to show up here and there, and should start increasing in numbers as the herring push in. Contact Mike to set up a trip before the dates really start filling up! Max, at Fisherman’s World in Norwalk, reports that the flounder reports seem to be picking up a bit in the harbor, especially for those who chummed heavily. Striped bass in the Housatonic has really picked up this week, and the herring are starting to show up. The topwater bite should be firing up soon, and the nighttime crew are already catching some better fish on herring imitators. The shop is fully stocked for the opening day of trout season with everything you would need, so be sure to stop in! Torrey, at Upcountry Sportfishing in New Hartford, that this week has once again seen a solid number of big holdover fish come from the river, as anglers are getting out there before the opening day crowds show up. Early Stoneflies #14-16 and Baetis/Blue Wing Olives #18-20 are popping in the afternoons. Early Black Stones (and a few Early Browns) have been active for a while now and both the holdover and wild fish have taken notice. You may see some risers but expect to go subsurface if not. Most of the larger fish that have been caught are coming on nymphs or streamers, fished slow and deep. The freshly stocked fish will continue to be receptive to several flies, including Woolly Buggers and Junk Flies. Captain Frank, of the the Frances Fleet in Narragansett, has spent the week tied to the docks getting the boat ready for the upcoming season. There have been some very encouraging reports from the draggers that have been seeing much more bait of Block Island recently; which is a good sign for both the upcoming cod fishing and fluke season. The fleet has now switched to a 5 day/week schedule; which includes Monday, Wednesday and Friday through Sunday at 7 a.m. They are currently waiting on the 2019 fluke regulations to be posted before the pick a start date, but that will likely be in mid-May, and when that happens they will be sailing daily. The tuna schedule has been finalized and they are taking reservations, along with private charter requests. Check in with the office for available dates! Captain Russ, of The Seven B’s in Snug Harbor, reports that they were not able to get out this week after cod, but they will continue to target cod into May if the interest is there, and the weather cooperates. They will transition over to daily fluke trips whenever they start to arrive in good numbers; which is typically mid-May. Mike, at Watch Hill Outfitters in Westerly, reports that the schoolie bass bite continues to improve a bit each day in the river and the breachways. The flounder reports have been on the slow side, but a few are being caught around Watch Hill and the Stonington area. The weather is looking good for opening day of trout season and Mike will have everything you need to target them! Dave, at Ocean State Tackle in Providence, told me that there is word of some small squid arriving in the Newport area, which is always a good sign for the fluke anglers. We shouldn’t be too far from the fluke and fresh striped bass season kicking off, but in the meantime schoolies can be found in the rivers and the breachways. Freshwater anglers are still reporting very good carp action throughout the state, and of course, opening day of trout season is just about here. Dave will be open until 11 p.m. on Friday and will open up again at 4 a.m. on Saturday and Sunday mornings. Opening day of trout season will take up most of the attention this weekend, and it appears we have lucked out weather-wise. Some rain is coming through Friday night, but it shouldn’t be a wash out, and it looks like we will touch 70 degrees Saturday! For those looking to avoid the trout crowds; carp reports have been strong in the freshwater, along with some steady pike action. In the salt/brackish water we’re seeing a nice spike in activity with the holdover striped bass, which will only improve with the influx of herring that should be approaching. White perch action finally seems to be kicking into gear, and it appears the flounder have started to wake up with the rise in water temperatures.